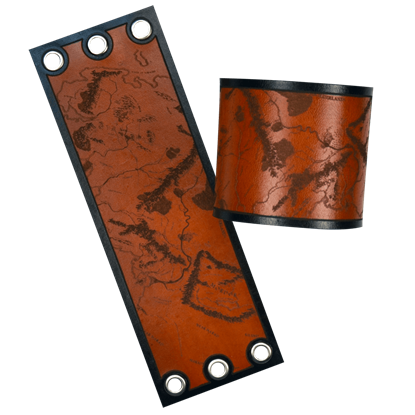 How many uses are there for leather wrist cuffs? Assuming that we are speaking technically, the answer is: one. But wait! Its a trick-question, because the answer is both one and several. You see, the only real use for a leather wrist cuff is to wear it. 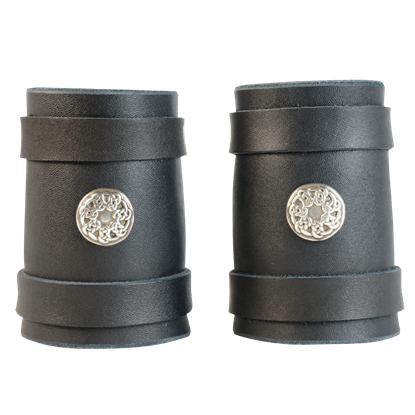 But because our leather wrist cuffs are so simple and elegant, they can be worn with dozens of different themes, enabling an item that features only one technical use to be used in dozens of new and exciting ways! 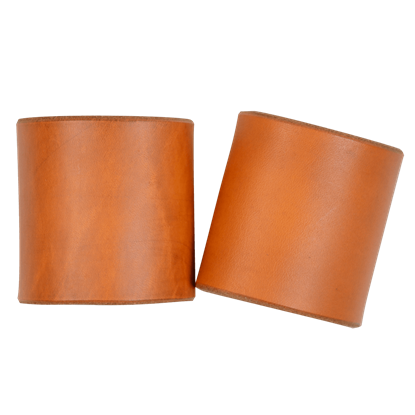 Virtually all of our leather wrist cuffs are great accessories for any fair-goer; they are small, unobtrusive, and a fantastic way to add subtle touches of personal style to your attire. And did we mention that they are all hand-crafted and top-quality? 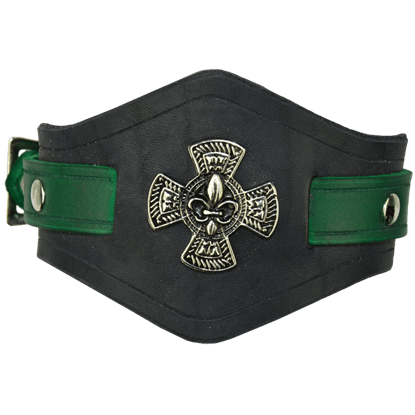 Coming in a massive variety of different colors and featuring things like dragons, Celtic designs, pirate emblems, and other medieval themed symbols, our leather wrist cuffs are great accessories no matter where you are going. Looking for a simple accessory? Try our wrist cuffs out, that add that extra detail, but are not near the size of a full arm bracer. The same as our Plain Wrist Cuff, this style has the addition of a studded cross in the center. 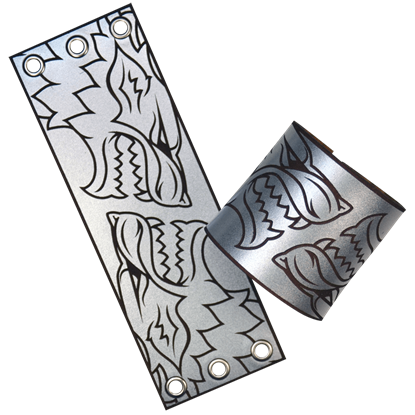 These wrist cuffs feature a highly detailed Silver Cross with Fleur de Lis. The wrist cuff measures 3 inches high at the widest part and tapers down to 1.625 inches to perfectly wrap around your wrist. It comes in different colors. 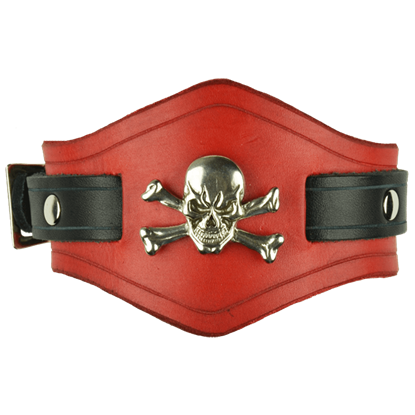 These wrist cuffs feature a mean looking Jolly Roger skull.. Yes, these wrist cuffs will make you feel like a pirate. The wrist cuff measures 3 inches high at the widest part and tapers down to 1.625 inches to fit around your wrist. 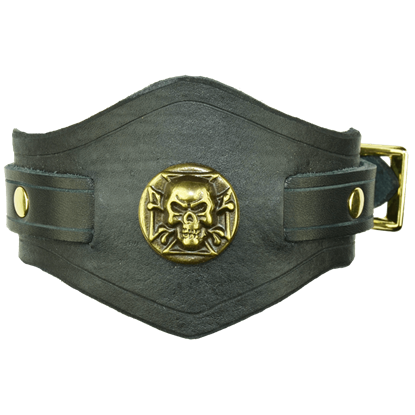 Heavy, top grain leather wristbands add strength to your sword arm and provide a functional accent to many period costumes. Pewter shield and leather bands are riveted. These are adjustable thanks to a laced closure. These wrist cuffs feature an evil pirate skull, possibly so evil they will stop strangers in their tracks and cause them to run the opposite way! Yes, these wrist cuffs will make you feel like a bad but oh so good pirate. Looking for a simple accessory? 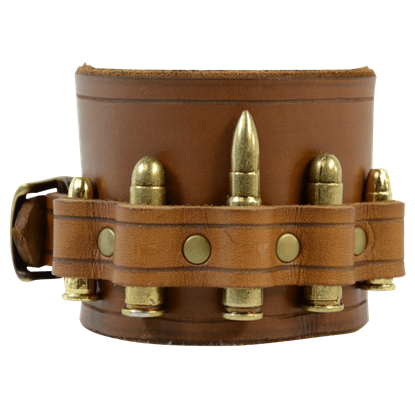 Try our wrist cuffs out, that add that extra detail, but are not near the size of a full arm bracer. They measure 2.5 inches wide and come in several wrist sizes. They fasten by two snaps. 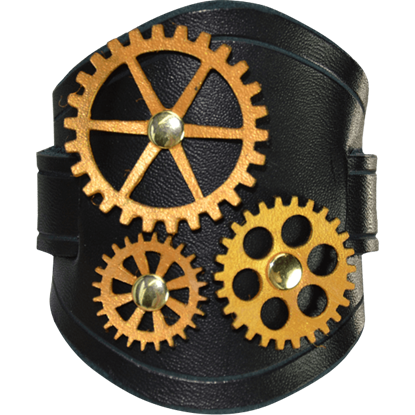 Are you looking for a subtle way to show your steampunk style? 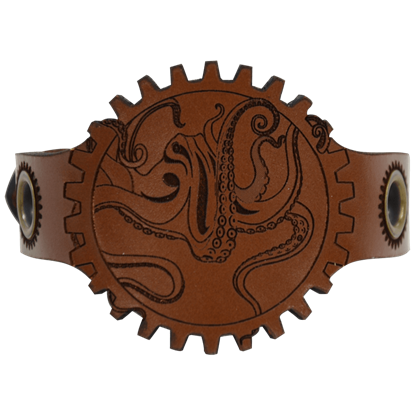 This Steampunk Octopus Wrist Cuff fits like a watch, yet with its incredibly engraved design, easily shows off your love and interest in all things that are steampunk. 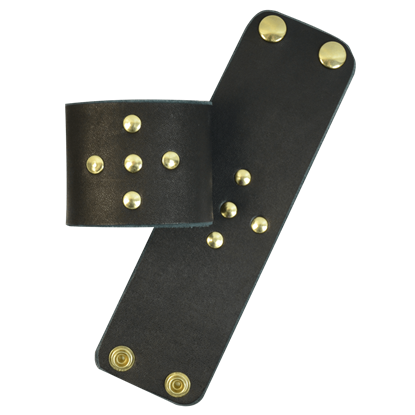 Adventurers of all sorts can benefit by wearing the Studded Wrist Bracers. 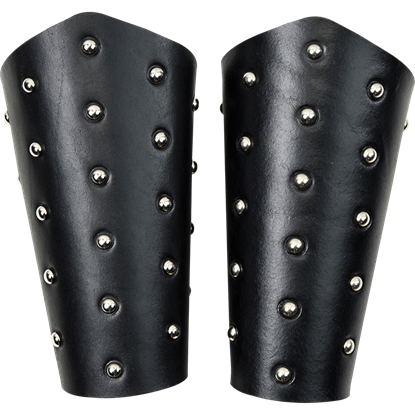 Easily added to most medieval, Renaissance, or fantasy outfits, these leather wrist bracers are versatile armour pieces with just the right amount of detail.